In this week’s episode Kathleen Dean Moore speaks with Joanna about: the circle of healing; falling in love with the grace of Nature; the greatest injustice in humankind’s history; stories of grief and wonder; the guiding force of environmental activists; integrity in action beyond hope and despair; approaching three crucial tipping points; Standing Rock, an outstanding example of extraordinary courage; the will to act with compassion; freeing our imagination for a better way; the joy of doing what is right. Kathleen Dean Moore is a writer, moral philosopher (she holds a Ph.D. from the University of Colorado), and environmental thought-leader, devoted to an unrelenting defense of the future against those who could pillage and wreck the planet. 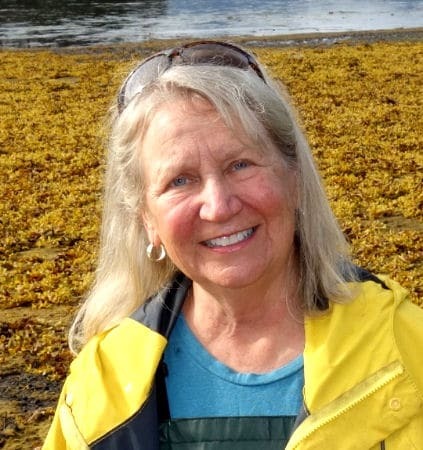 As a writer, Kathleen is best known for award-winning books of essays that celebrate and explore the meaning of the wet, wild world of rivers, islands, and tidal shores – “Riverwalking”, “Holdfast”, “The Pine Island Paradox”, and “Wild Comfort”. Her new books are “Great Tide Rising: Finding Clarity and Moral Courage to Confront Climate Change”, and her latest, “Piano Tide: A Novel”.